Optimum sensitivity with automatic retuning. 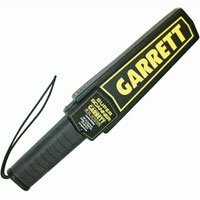 Detects all ferrous, non-ferrous and stainless steel weapons, contraband and other metallic objects. 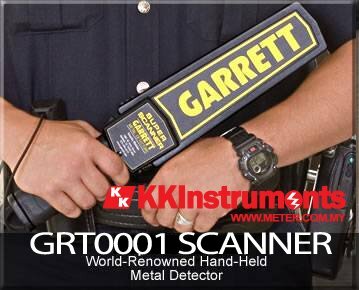 A long-time favorite of security and law enforcement professionals around the world, the GRT0001 is virtually eliminating the need for pat downs during weapons screenings. -Large 10 inch scan surface for quick, thorough scanning. -No tools required to change standard 9V battery (included). Optional rechargeable battery kit available. -Sharp audible alarm and bright red LED light indicates the detection of metal. -Momentary push button helps temporarily eliminate detection of nearby ambient metal such as rebar, metal walls. -Three-color LED indication: Green LED light indicates ON; Amber LED indicates LOW BATTERY: Red LED indicates ALARM. Buy genuine metal scanner from KKInstruments.